Although stretch marks are a typical, yet annoying part of life, most people wish that they could make them permanently disappear. There is an entire industry built around creams, lotions, and even surgery to help conceal these imperfections, but a Brazilian tattoo artist developed a much simpler, more effective solution that Alicia Shapira has learned and now offers here at her studio New Image Beauty Bar in Coral Springs, Florida! Rodolpho Torres, of São Paulo, uses flesh colored ink to hide stretch marks as well as circles under the eye. Anvisa (National Agency of Sanitary Surveillance) has approved his ink, and he personalizes each mixture to achieve a tone similar to that of the client’s skin. The ink blends into the stretch marks, giving them the color of the skin. Once the tattoos have healed, the client’s skin appears smoother, and after sixty days they can sunbathe without the risk of spots developing. Now, this technique has officially made its way to the United States, where Alicia Shapira has learned and practiced to provide you with the stretch mark tattoo camouflage treatment, without having to travel to Brazil! “This is a phenomenal procedure everyone can appreciate and love- and now it’s practically in your own back yard of South Florida!” says Alicia. “I just ordered all of my ink to be delivered soon, and I am beginning to accept appointments for this treatment, so hurry and call because people would be crazy not to take advantage of this”. The technique is a closely guarded secret, and there is only a handful of artists who can perform this technique, Alicia is proud to be one of them. 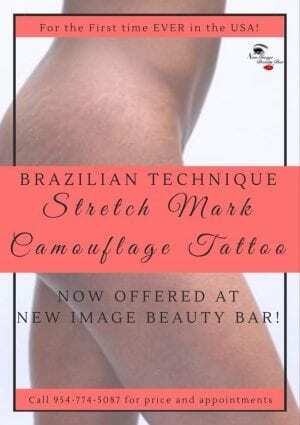 For appointments to book your stretch mark camouflage tattoo treatment, or for more information regarding pricing, please call or text 954-774-5087. © 2016 NEW IMAGE BEAUTY BAR SEO Does Matter Inc.